The most colorful, vivid and vibrant film industry produces more than 1,500 films a year. Learn more about its tradition and stars. Some 14 million Indians go to the movies every day. The price of admittance to the cinema is the equivalent of the typical Indian’s daily wage. So, what they go to see must be really good. Right? The production of movies in India is handled by Bollywood. Let’s find out more. 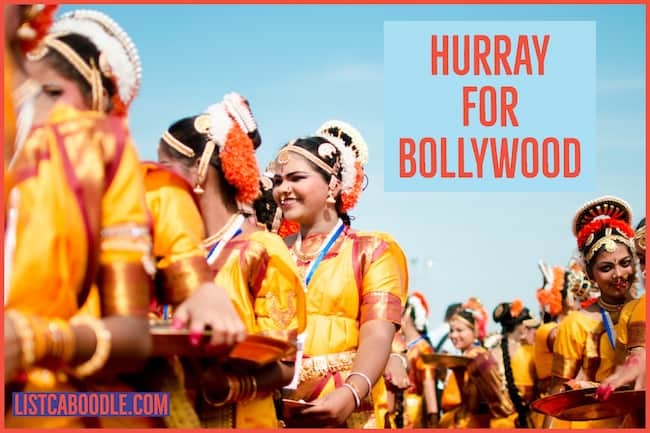 Bollywood, the Indian equivalent of Hollywood, is perhaps the most colorful, vivid, and vibrant film industry on the planet. The industry gets its name from Bombay, the city where it’s centered and Hollywood, the American film industry. The name became more pronounced in the 1970s when the Indian film industry became the largest film producer, surpassing Hollywood (in terms of number of films produced annually). Overall, Bollywood includes the entire Indian film industry that produces films in all the Indian languages. Here are 10 fascinating fun facts on Bollywood to help you learn more about it. The history of Bollywood goes back to the early 20th century. Raja Harishchandra is the first Indian feature film, released in 1913. The film industry grew at a fast pace and was producing more than 200 films in the 1930s. Alam Ara by Ardeshir Irani is the first sound film released by the industry. And in 1937, the same producer brought the first Indian color film, Kisan Kanya. Interestingly, color films didn’t gain much popularity in the Indian market until the 1950s. In its history of over a century, Bollywood has given some of the greatest work of cinema to the world. Some of the notable names in this list include Awaara (1951) by Raj Kapoor, Mother India (1957) by Mehboob Khan, Sholay (1975) by G.P. Sippy, Pyaasa (1957) by Guru Dutt, and Aandhi (1975) by J. Om Prakash and Gulzar among many others. This is a must-watch list for anyone who is interested in the work of the Indian film industry. Dangal: The film collected a record $330 million worldwide. Baahubali 2: The Conclusion: This epic drama made a staggering $260 million worldwide. Secret Superstar: This Aamir Khan starring film collected over $150 million across theaters worldwide. Bajrangi Bhaijaan: This Salman Khan starring film minted $149 million across the world. PK: An interesting Aamir Khan starring film that questions religion and traditions that collected over $140 million. Mughal-E-Azam: The film is based on the love story between the Mughal prince Salim and the Emperor’s courtesan Anarkali. The role of Salim and Anarkali by Dilip Kumar and Madhubala respectively is immortalized forever. Saajan: A love triangle with gripping songs, Saajan is a poetic celebration of love in all its grandeur. Bombay: This Tamil movie by Mani Ratnam brings together lovers from two different communities and all the conflict that comes along with it. It is loved as much as for its story and visuals as much as for its songs. Maine Pyar Kiya: A film that celebrates innocent love, is another romantic cult classic with songs that never lose their charm. Dilwale Dulhania Le Jayenge: This film has the longest-running film record in Bollywood, overtaking Sholay. The romantic flick was released in 1995 and continued to run for 1,009 weeks until 2015. Some of the other popular Indian romantic films that have won the heart and mind of billions include Hum Dil De Chuke Sanam and Veer-Zaara. Rajshri.com: One of Bollywood’s oldest film studios also allows you to watch Indian films and TV shows made in different languages. BigFlix.com: This site brings you both paid and free movies. It offers movies in over a dozen languages. IMDb.com: Besides providing all the information on films and actors, the Internet Movie Database also has a huge selection of full-length movies, including Indian films. HotStar.com: You can watch Indian movies on this online streaming service on the web or even within the app. Veoh: This site also offers a huge collection of free and legal Indian movies. YouTube: The largest video-sharing site also hosts hundreds of Indian films and allows you to watch for free or a small charge. Sholay is considered as one of the best Indian films ever made. An action, romantic and adventure film, Sholay is the second-longest running Indian film and considered the most popular and arguably the best in this film industry. The 2002 British Film Institute poll ranks it among the Top 10 Indian Films of all time. The 2005 Filmfare Awards’ judges named Sholay as the Best Film of 50 Years. Interestingly, at the time of its release in 1975, the film received nothing but negative critical reviews and performed badly at the box office. It was over the years that it gained popularity and commercial success, becoming the longest-running Indian film at a time (running for over 5 years at a stretch in a movie theater). After inflation adjustment, it is also regarded as the highest-grossing Indian film of all time. The ‘dacoit western’ film tells the story of a former police officer who enlists the services of two small-time thieves to carry out his revenge against a well-known bandit. There are very few western classics in the history of Bollywood and this one is worth watching the most. While the works of John Wayne and Clint Eastwood gave Hollywood (and the world) some of the most memorable characters and one-liners, Sholay played its own part in the Indian film industry. Nargis: Having worked in films like Mother India (nominated for Academy Award) and Awaara, Nargis is considered among the greatest actresses in Indian cinema. Madhubala: The Mughal-E-Azam actress is considered one of the most beautiful actresses ever in Indian film industry. Sridevi: A versatile actress capable of playing different types of roles, Sridevi is the first female superstar in Indian cinema. The CNN-IBN 2013 national poll voted her as India’s Greatest Actress in 100 Years. Aishwarya Rai Bachchan: This 1994 Miss World pageant winner is often regarded as the most beautiful woman in the world. The green and blue-eyed actress is as good a performer on the screen as beautiful she is. Some of her best films include Hum Dil De Chuke Sanam, Devdas, Mohabbatein, and Jodhaa Akbar. Some of the other equally popular Bollywood actresses include Madhuri Dixit, Meena Kumari, Rekha, Kajol, and Hema Malini. Indian film actors are cherished as much as for their looks as for their acting skills. Some of the most popular Bollywood male actors are also among the richest men in the global film industry. Amitabh Bachchan: Considered the greatest Indian film actor, Amitabh Bachchan has worked in over 190 films and has a career that spans more than 50 years. His most famous works include Sholay, Zanjeer, and Deewaar. Raj Kapoor: Famously known as the Great Showman of Hindi Cinema or “the Clark Gable of Indian film”, Raj Kapoor is regarded as the most influential actor and filmmaker in Indian cinema’s history. His greatest works include Awaara, Mera Naam Joker, and Shree 420. Shah Rukh Khan: The King of Bollywood, Shah Rukh Khan is considered the most successful Bollywood actor and one of the most successful film stars in the world. Some of his best works include Dilwale Dulhania Le Jayenge, Kuch Kuch Hota Hai, Swades, Devdas, and Dil to Pagal Hai. Some of the other notable Indian film male actors who have achieved profound fame and success include Aamir Khan, Salman Khan, Dilip Kumar, Guru Dutt, Rajesh Khanna, Dev Anand, Anupam Kher, Rajnikanth, and Shashi Kapoor. Dance is as much as part of Bollywood as the songs. While traditionally, the focus has been on classical Indian dance, there has been enhanced influence of western dance on Indian cinema. It is not surprising to come across both pure classical and western pop dance numbers in the same films. Most films will have the hero and heroine performing along with a troupe of support dancers with lots of color and beautiful locations in the background. Some of the most popular dancers in the industry include Aishwarya Rai Bachchan, Madhuri Dixit, Sridevi, Hrithik Roshan, Prabhu Deva, Rekha, Waheeda Rahman, Meenakshi Seshadri, Shammi Kapoor, Mithun Chakraborty, Madhubala, and Meena Kumari. India currently produces more than 1500 films in a year. It is poised to become a $3.7 billion industry in 2020 and is growing at a rate faster than 10% (CAGR). The growing per capita income of the country and the huge Indian Diaspora around the world means that it is set to grow at an unmatched rate in the future.